Basham, Lee. 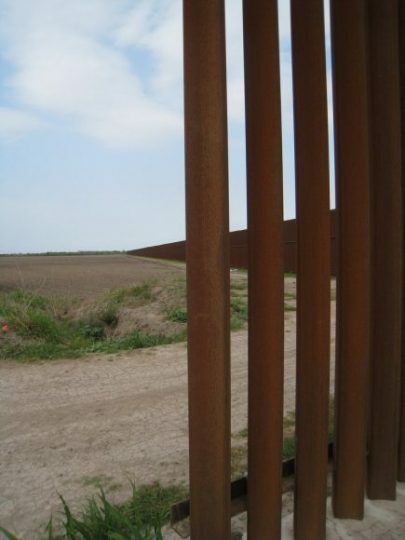 “Border Wall Post Truth: Case Study.” Social Epistemology Review and Reply Collective 6, no. 7 (2017): 40-49. Riggio, Adam. “Subverting Reality: We Are Not ‘Post-Truth,’ But in a Battle for Public Trust.” Social Epistemology Review and Reply Collective 6, no. 3 (2017): 66-73. Dogs don’t look Up. The higher tossed the bone, the less likely they are to see it. Lost in a horizontal universe, they run tight circles, wondering, “where is it?”. On its way down it hits them on the head. Civilized primates are surely different. Our steep information hierarchies are different. Or in the high castles of information a few above look upon many circling below. Far South Texas, a bone’s throw (or gun shot) from the US/Mexican border, enjoys post truth as a storied and comfortable tradition. So stable, we might question the addendum “post”. Here truth is ephemeral. Like rain, it appears rarely. When it does it collects in pools, grows strange stuff, gets smelly and then dries up. Are we suddenly flung into a post-truth world? The sophists lost that one, the Stalinists, too. But history’s lessons, like a grade 2 curriculum, never end. They remain the same. Hope springs eternal. Adam Riggio, in “Subverting Reality”, takes a personal approach, emphasizing trust before truth, even providing a theory of true punk music; if form then content. All else is appropriation. Meet fake punk. While I’m not sure about that, I’m sympathetic. Perhaps form does not formulate in the end, which is why we should be suspicious of any form-allegiance. Including representational democracy. But his is an understandable approach. Like Riggio, I’ll take a personal line. In letter to the editor style: I reside in McAllen, Texas. It is in the Rio Grande Valley. Locals call this the “RGV” or “956”. Table chat I’ve shared in the wealthy parlors of Austin and San Antonio insists we are not really part of Texas, “They’re all Mexican”. But the map indicates we are. Because we are on the North side of the river. A few miles South of town we have a long stretch of the Mexico/US Border. The Wall. It looks like minimalist conceptual art from the 1960s. Donald Judd comes to mind, Donald Trump, too. Professional photographers adore it, prostrate before it. They fly in just to see and click. The border wall is by nature post-trust and so, post-truth. This Post Truth is a concrete condition. Literally. Made of concrete and steel, I’ve climbed it. Took me 1.5 minutes (a bit slower than average; wear tennis shoes, not boots). Recently, epistemologists have explored this scenario. Suspicion is natural to social primate life, not shocking, misplaced or shameful: The battle is not for trust, but realistic, strategic distrust. We are Texas and proud we are. We proudly supply Washington DC with its cocaine, providing the capital the highest quality, best prices, in vast quantities. Our product is legend, a truly international undertaking, spanning 13 countries. This is our number one economic achievement. We proudly provide the largest, most vibrant, corporate retail experience to be found anywhere between San Antonio and the Federal District of Mexico. Our shopping is legend, a truly international undertaking, filling the parking lots with cars from the Mexican states of Tamaulipas, Nuevo Leon, DF, alongside Canadian vehicles from Ontario, Alberta Quebec and others. We are Texas and proud we are. This is our number one economic achievement. As one might imagine, such a list goes on. The local banks reflect our achievement. Billions of dollars beyond the productive abilities of our local legal economy are on deposit. Almost every penny in the banks is owned to the success of our local legal economy. But what I take to be our greatest achievement, which all this and more rests upon, is the borderland mind. In the parlance of the moment, it is deliciously post-trust and post-truth. If this isn’t social epistemology, what is? I have lived on the border for more than a decade. My wife, originally from Monterrey, Mexico, and her family, have lived here since she was 14, and for several years before that just a few blocks South of the river’s South side. While most academics are Anglo imports and cling to the same, I didn’t make that mistake. Her family and my friends provide an intimate understanding. At the 2010 census the city of Escobares had a population of 1,188. The racial composition of the population was 98.3% white (7.2% non-Hispanic white), 1.6% from some other race and 0.1% from two or more races. Yet, 92.8% of the population was Hispanic or Latino with 92.3% identifying as being ethnically Mexican. Escobares is a white town? McAllen has a nearly identical US census profile. Derisive laughter on local radio and in front yard parties follows. The Wall is patchy, has gaps. Erected by President Obama, many miles here, many miles there, ropes dangle everywhere to help travelers across it. Little kid’s shoes, kicked off as they climb, litter its base. Sometimes the kids fall. The Wall is not monolithic. Nor opinion. Surprisingly, in an almost entirely Hispanic community, completing The Wall is both opposed and supported by many. Often the same people. This is not insanity, it is time honored strategy. Brings to mind the old movies where people hang two-sided picture frames with opposing photos, and flip the frame according to what a glance out the window informs them about their arriving guests. The photos mean nothing, the flipping, everything. Fireside conversations become remarkable. The anti-wall protests of local politicians are viewed in a familiar post-truth, fading race-war narrative: They have to say that. Both Democrats and Republicans copy cat this story line and then deny any allegiance to it at Rotary club meetings before racially well-mixed and approving audiences. Legal trade is good, the rest is a mess. Why a wall? None of them would do any lucrative illegal business. They pray before their meetings. But Northern cities in Mexico promote ineffective boycotts of McAllen’s retail miracle because of The Wall. They fear it hurts them financially. Odd. The McAllen Mayor responds by stringing a broad, mixed language banner across main street, declaring, “Bienvenidos to McAllen, Always Amigos”. The Wall issue dissolves. Charades require political tension, sincere or contrived, perhaps a tactic of negotiation. Why local support for The Wall? Too many headless bodies, too many severed heads. People are sick of the untouchable prostitution trap houses north and east of town. Fenced in, barbed wired, cinder-block buildings with armed guards, stocked with poached immigrant girls and boys, a parking lot full of Ford F150 trucks. The kidnappings of immigrants, the torture chambers and videos when the money never arrives. The ones that by shear luck avoid such fates are relegated to back country depots and “abandoned” houses. Often they are abandoned, forced to burglarize and rob to eat and continue their trek north. People are also tired of the border’s relentless yet ironically impotent police state. One cannot drive the 57 miles from McAllen Texas to Rio Grande City without passing 20 or more roadside State Troopers in their cartel-black SUVs. Don’t bother to count the border patrol SUVs: They are more numerous. The State Troopers, euphemistically agents of “The Department of Public Safety (DPS)”, fill our now crowded jails with locals, on every imaginable infraction, no matter how trivial. After asking me where I lived, at the end of a convenience store line conversation, one told me, white on white, “Then ya know, people here are bad.”  These are not local Sheriffs, born and raised here, who understand people and who is and isn’t a problem. DPS is relentless, setting impromptu road blocks throughout our cities, tossing poor people in “county” for not having car insurance and the money to pay for it on the spot. Whole Facebook pages are devoted to avoiding the road-blocks in 956. Down at McAllen’s airport entire multi-story, brand new hotels are now filled with foreign agents of the state. The whole monster-mash, everyday is Halloween scène down on the border could be chronicled for pages. All of this is perceived by a hardworking, fun-loving, family-driven community as an ill wind from the South, drawn by the bait-and-switch vacuum of an uncaring, all-consuming “great white north”, and a Washingtonian two-face. Right they are. With The Wall, perhaps these police-state parasites will leave. The slave traps will wither by the rule of no supply. Rich white and agringado activists up North be damned; who for their own, disconnected reasons, demand it never end. To quote a close relative, “Nombre! They don’t live here!”. People see The Wall as a conspiracy to placate the xenophobes up North, not protect anyone. Keep the cheap labor coming but assert, “We did something to stop it.”. People see The Wall as protection for those who otherwise would cross and fall into the many traps set for them by the coyotes, they also see The Wall as protection for themselves. They see The Wall as a conspiracy supported by the drug cartels and the Mexican government the cartels control (its official protests not withstanding) to simplify the business model, driving the local cells and resident smuggling entrepreneurs out of business. Using operatives in ICE and the Border patrol is more efficient: Cut out the middle women and men. People lament the damage this will do to our local economy and in some cases, personal income. People praise this. People see those who in the North who oppose The Wall as political fodder used by those who could not care less about them, but want to pretend they do without having a clue, or even trying to. People believe The Wall is a conspiracy, not just to keep Hispanics out, which they often despise depending on country (“OTMs”, Other than Mexicans) but to keep Americans in. As I quickly learned, though few border-landers verbally self-identify as “Mexicans” (that takes a trip across the river), they view a dangerous Mexico as safe-haven if things “go south” here in the United States. If a theoretical, grave political or economic crisis occurs, or just a particularly unpleasant but very real legal entanglement, escape to Mexico is their first resort. People ask, after the finished wall, added concertina wire and all, what if they close the bridges? When they need to run, they want to be able. People see The Wall as an attempt to destroy the Mexican economy, forcing them into the proposed North American Union, where Canada has submitted in principle, and the only hold-outs are the resolute patriots of the Republic of Mexico, “Mexico, so far from God, so close to the United States”. Washington will never be its capital. A noble sentiment. More pedestrian conspiracy theories circulate about campaign contributions from international construction corporations and their local minions. Workers on both sides of the river hope the fix is in; it means jobs for everyone. Recall the Israeli government hired eager Palestinians to build their wall; but that’s another post truth reality. Revealingly, the Israeli example has been promoted in the American press as a model with the notorious phrase, “best practices”. Such is the politics of promised lands. Post truth is, first, access to a shared, community truth, is now lost. But that would only entail agnosticism. Post truth is more. It is also, second, seemingly contradictory claims now have equal legitimacy in the government, media and with the citizenry. No one looks up. This is an unlikely construct. Like choosing wallpaper, but this time for the mind, what a citizen believes, political, economic or otherwise, is entirely a matter of personal taste. And there is no accounting for taste. No epistemic grounds for ordinary controversy, but insidiously a double-truth theory laid upon the collective consciousness of democratic society. Collective madness. Hence: A post truth world. It’s a catastrophe. Or is it? Look up at the above. What is epistemically interesting is that most of the conspiratorial stances above do enjoy some significant evidence and are mutually consistent. Hence simultaneously believed by the same persons. Enter real “post truth”, and a larger diagnosis of our information hierarchy. It is not reliable. Instead we look to each other. Post truth is about epistemology, social and otherwise, but only at one or more steps removed. On the ground it is entirely pragmatic. Post truth is not to be confused with mere state propaganda. That is another, much more narrow notion. Post truth, as before defined, is ancient and ubiquitous. The 21st century is no different. 1. The first, a bit tiresome to repeat, is found in several epistemic critiques of the pathologizing approach to conspiracy theory: We should not conflate suspicions with beliefs. There is nothing cognitively anomalous about post truth states of consciousness when read this way. Suspicion is epistemically virtuous. The fears surrounding ambitions of pathology, how ever great, are immediately de-sized in face of this simple distinction. Suspicion is one of the virtues of Eric Blair’s famous character, Winston Smith—at least until he trusts and is captured, tortured and turned. 2. “Post” implies a time before that has passed. More formally, it might be termed a tense-based situational truth agnosticism. Applied to “trust” and “truth”, on the border, this proposed time before would require reference to the more social and intelligent Pleistocene mammals. Maybe to the first human visitors, ten or more thousand years ago, no doubt in search for water. An attitude of panic towards “post truth” seems misplaced. Nothing can survive laughter. This is a second suggestion. Post truth hysteria is, while initially quite understandable, difficult to take seriously for long. Rage concerning it, even more so. 3. Linguists point out that “trust” and “truth” are closely related. One births the other. By accident and so inclination, I am an epistemologist of trust, especially its “negative spaces”, to borrow from art-theory. These spaces in our current information hierarchy, where so few control what so many hear, and often believe, are legion. In our society navigating these is elevated to high art, one we should not fear. My third suggestion is that if nothing changes then nothing changes. And my prediction, nothing changes in a post truth world. Because nothing has changed. Or soon will. Post trust is not the new normal, it is the oldest one. You don’t know people, or societies, until you go about with them. We should be cautious, watchful. As my son would put it, “We should lurk them hard”. A skeptical attitude, an expectation of post truth because of a post trust attitude, is appropriate, an adult attitude. Among billions of humans of all types and classes, we hardly know anyone. And those who protest this, doth protest too much. Such an attitude of truth-privilege, as found among the denizens of the political Avant-gardes and their fellow travelers in our mass media, has always been unearned. One often betrayed. Professional managers of belief I will grant the mainstream media, professional purveyors of truth is quite a stretch, a needless one. But a conceit that has proven lethal. Consider the 2003 Iraq invasion. We were told at the time, by both current and prior presidents, it was an invasion for feminism. The media, including the New York Times, chimed in approval. Normalizing this invasion was this media’s crowning achievement of the 21st century’s first decade. One might think they got off on the wrong foot, but that would entirely depend on what the right foot is. I argue for a more functional outlook. Their function is basic societal stability, congruence with official narratives when these are fundamental ones, not truth; an establishment of normality in virtually anything. Truth has its place at their table only among the trivial, not basic stability. Consider the US civil rights movement. Here the political Avant-gardes and mass media had an effect we view as laudable. Yet this did not threaten the established political or capitalist order. It ushered old participants into greater integration within it and to new levels of participation on its behalf. Mr. Obama, for instance. Old ideas may not fit the current reality; the war against terrorism to take the most current example, requires international cooperation that is radically undeveloped in theory as it is in practice. We should welcome military officers into the theoretical argument. They will make it a better argument than it would be if no one but professors took interest. Walzer asks to take his place among the generals. Walzer goes on to argue for the importance of aerial bombing while trying not to blow rather younger children to smithereens. Walzer’s justification? Protecting US soldiers. If any of this strikes us as new or news, we live in what I like to call the united states of amnesia. He claims current bombing technology overwhelmingly protects the innocent. An interesting post truth formula. Who then are the guilty soldiers and functionaries, and how could they be? Denounce the stray bomb fragments, then embrace the counsel of professional conspirators of death in our moral considerations. This is suspect, politically, morally and epistemically. It is also feminism. That’s a post truth world. Long before a real estate agent joined the pantheon of US presidents. The rebellion of conspiracy theory helps here. Conspiracy theory is typically, and properly, about suspicion, not belief. Certainty, even if just psychological, “truth”, is not an option in a responsible citizen. A vehement lament and protest against post-truth is inadequate if it ignores the importance of suspicion. But nothing like suspicion post-trusts and so post-truths. To borrow a lyric from Cohen, “that’s where the light comes in”. And we post-any-century-primates have good reason for suspicion. True, the opening years of the 21st century hit a home-run here, it wasn’t the first or last. If anything is transcendently true, that’s it. Let’s conspire against citizens who worry you might be conspiring against them. Is there anything new here? Like Riggio, I view the existence of political truth as beyond evident. In the face of rhetoric concerning a “post truth” contagion, Riggio counters there is instead a battle for public trust. He’s right. He’s channeling, in fact, Brian Keeley’s classic public trust approach to alternative thought. As with our confidence in science, mainstream media functions the same. But Riggio seems to think it is a new one, and one worth fighting and “winning”. Now what would be winning? As we finally fall asleep at night, we might appreciate this. But not in daylight. There’s no battle for public trust there. Most don’t, but say we do. And that’s a good thing. Public trust has long ago headed down the yellow brick road with Dorothy in search of a wizard. Lies and compromise are recognized, from all quarters, as our long-term norm. Dorothy’s surprise and the wizard’s protests when he is revealed should hardly surprise. This is the road of the golden calf, representational democracy. [Mainstream media’s behavior] harms their reputation as sources of trustworthy knowledge about the world. Their knowledge of their real inadequacy can be seen in their steps to repair their knowledge production processes. These efforts are not a submission to the propagandistic demands of the Trump Presidency, but an attempt to rebuild real research capacities after the internet era’s disastrous collapse of the traditional newspaper industry. I see this as idealized media primitivism, “If only we could go back”. It’s absolutely admirable. But was print media ever supposed to be trusted? Print media set the stage for the invasion of Cuba and Mexico. It suppressed the deadly effects of nuclear testing in in the 1950s and 60s and then promulgated apologetics for the same. Between 1963 and 1967 the Vietnam War was, “the good guys shooting the Reds”. It played a similar role in Central American intervention, as well as the first and second “gulf” wars, fought deep in the desert. Mainstream media has long been superb at helping start wars, but way late to the anti-war party and poor in slowing or ending the same wars they supported. A post truth world hypothesis predicts this. An interesting point, one more interesting the more intense the consequences are. The more seemingly significant a political event—such as bizarre politics or senseless wars—the more normal it is initially portrayed by mainstream media. Eventually damage control follows. Public trust? Not likely. Certainly not well placed. 5. So a final, fifth suggestion: Our paleo post-truth vision taps on our shoulders: The “new normal” political panic concerning a “post truth” world we find in political conversation and in mass media is an ahistorical and ephemeral protest. Our strange amnesia concerning our wars, the conduct of such and their strange results should be evidence enough. Communist Vietnam, with its victory in 1975, was by 1980 a capitalist country par excellence. An old point, going back to Orson Wells’ Citizen Kane. “I remember the good ole days when we had newspapers” seems an unlikely thesis. Recall Eastern Europe. While giving a talk on conspiracy theories and media in Romania, one that might be characterized as a post truth position on media reliability in times of extreme crisis, the audience found the remarks welcome but fairly obvious. They doubted we of the West really had a free mainstream media in contrast, but they enjoyed the idea, the way we might enjoy a guest’s puppy; he’s cute. The truth can be toxic in many social and political settings. Good arguments indicate mass media hierarchies react accordingly everywhere. Far from being tempted to promulgate such truths, like afore mentioned hungry dog and baby, they leave toxic investigation alone. Why look? Why bite? Politicization of knowledge is dubious. “Post Truth” is a political term of abuse, one that will quickly pass; a bear trap that springs on any and all. Just before the first World War, in 1912, Bertrand Russell pointed out that the truth “must be strange” about the most ordinary things, like tables or chairs. Are politics, mass media power, any less strange? Now we all stand, down by the river, awaiting the evening’s usual transactions and gunfire. We live in the united states of amnesia. In the rush of cotemporary civilization, memories are short, attention fractured and concentration quickly perishes. We just move on. The awesome spectacle of seemingly omnipotent governments and ideologically unified corporate global mass media along with a population driven by consumption and hedonism, might create a sense of futility where subversive narratives are concerned. But then in new form the subversive narratives are reborn and powerfully spread. The growing intensity of this cycle should give us pause. Perhaps the answer does not lie in seeking new, remedial, intellectually sophisticated ways to ignore it, but in addressing our information desert, our scarcity of real epistemic access to the information hierarchy hovering above us. And discovering ways this can be reversed in a world of unprecedented connectivity, so epistemic rationality can play a decisive role. For some this truth about post truth and its vicious ironies creates a scary place. Here on the edge of the United States, people have learned to live through that edge and embrace it. But in cozy heartlands in the US, Canada and Europe, most prefer to die in the comfort of our TV rooms so we don’t die “out there”, as Cormac McCarthy puts it, “…in all that darkness and all that cold”. But when the long reality of a post trust, post truth world is forcibly brought to their attention by real estate developers, some react, like Dorothy, with rage and despair. This is a mistake. Social epistemology should embrace a socially borne epistemic skepticism. This is not an airborne toxic event, it is fresh air. Social epistemology might not be about explaining what we know so much as explaining what we don’t and the value of this negative space, its inescapability and benefits: The truth about post trust and truth. Post truth is everywhere, not just here on the border. We can’t land in Washington DC at Ronald Regan international airport and escape it. Welcome to the post-truth border, bienvenidos al frontera, where we all live and always have. Certainty is an enemy of the wise. If thought a virtue, representational democracy is the cure. This returns us to dogs. Dog-like, though we be, primates can certainly learn to look up in intense interest. At the stars, for instance. I oppose The Wall. And can climb it. We don’t know until we go. The border is just beyond your cellar door. Do you live in Boston? There you are. Once you open up, look up. Don’t circle about in tight illusions. Embrace bright, buzzing, booming confusion. You don’t know my real name. Chilvers, Ian & Glaves-Smith, John eds., Dictionary of Modern and Contemporary Art. Oxford: Oxford University Press, 2009. The latter are the so called “Winter Texans”. Fleeing the North’s ice and snow, but unwilling to cross the border and venture farther South into Mexico (except for one military controlled, dusty tourist town immediately across the river, wonderfully named “Nuevo Progreso”), they make their home here through fall, winter and spring. United States Census Bureau. Archived from the original on 2013-09-11. Retrieved 2008-01-31. DPS officers are not all this way. Many are quite compassionate, and increasingly confused by their massive presence here. President Porfirio Diaz, “Tan lejos de Dios y tan cerca de los Estados Unidos.”. See Basham, Lee and Matthew R. X. Dentith. “Social Science’s Conspiracy-Theory Panic: Now They Want to Cure Everyone.” Social Epistemology Review and Reply Collective 5, no. 10 (2016): 12-19, and subsequent remarks, Dieguez, Sebastian, Gérald Bronner, Véronique Campion-Vincent, Sylvain Delouvée, Nicolas Gauvrit, Anthony Lantian & Pascal Wagner-Egger. “’They’ Respond: Comments on Basham et al.’s ‘Social Science’s Conspiracy-Theory Panic: Now They Want to Cure Everyone’.” Social Epistemology Review and Reply Collective 5, no. 12 (2016): 20-39. Basham, Lee. “Pathologizing Open Societies: A Reply to the Le Monde Social Scientists.” Social Epistemology Review and Reply Collective 6, no. 2 (2017): 59-68. While a realist about truth, a situational truth agnosticism does not entail warrant/justification agnosticism. We don’t need to know if something is true to know it is probably true, given our best evidence, or probably not true. The political fate of Bernie Sanders comes to mind. A fine candidate, and my preferred, he was forced to recant at the Democratic Party Convention in 2016. One recalls the Hindenburg. The usual US suspects include CNN (“Combat News Network” in 2003-10 and more recently, “Clinton News Network”), NBC (“National Bombing Communications”) and FOX (a bit harder to parody due to the “x”, even though Mr. O’Reilly offered his services). George W. Bush and William J. Clinton. Walzer, Michael. “International Justice, War Crimes, and Terrorism: The U.S. Record.” Social Research, 69, no. 4 (winter 2002): 936. Cass Sunstein and Adrian Vermeule, “Conspiracy Theories: Causes and Cures”, University of Chicago Law School Public Law & Legal Theory Research Paper Series Paper No. 199 and University of Chicago Law School Law & Economics Research Paper Series Paper No. 387, 2008, 19, reprinted in the Journal of Political Philosophy, 2009. Keeley, Brian. “Of Conspiracy Theories”, Journal of Philosophy, 96, no. 3 (1999): 109-26. Keeley’s is a classic, but the Public Trust Approach (PTA) he advocates appears to fail on several levels. See the several critiques by Lee Basham, David Coady, Charles Pigden and Matthew R.X. Dentith. Not only farce, but a fair share. Riggio, Adam. “Subverting Reality: We Are Not ‘Post-Truth,’ But in a Battle for Public Trust.” Social Epistemology Review and Reply Collective 6, no. 3 (2017): 71. See Hallin, Daniel C. The Uncensored War: The Media and Vietnam. New York: Oxford University Press, 1986. A paraphrase from, “Conspiracy and Rationality” in Beyond Rationality, Contemporary Issues.Rom Harré and Carl Jenson, eds. Cambridge Scholars, Newcastle (2011): 84-85. James, William. The Principles of Psychology. Cambridge, MA, Harvard University Press, 1890, page 462.